Don't miss out. There's only 4 available and 4 other people have this in their cart right now. Don't miss out. There's only 1 available, and 4 other people have this in their cart right now. These slices are small. Check Size Prior to Purchase. Per Silicone Manufacturer these molds are safe for use with food products. If you used non-edible material in your mold first don’t then use it for edible material to avoid cross contamination. Example: I keep my molds for chocolate etc., separate from the molds I use to make soap embeds. See my blog link below for HOW TO tips and suggestions. Resin will not come out shiny with these molds. It will be matte. Just make sure your mold is the size you need for the project you want to create! *Please check the size prior to purchase. *Chocolate, Butter, sugar, cream mint recipes and fondant work wonderful in the mold to adorn cakes and cupcakes or makes wonderful little sugars for tea party’s or butter pats! 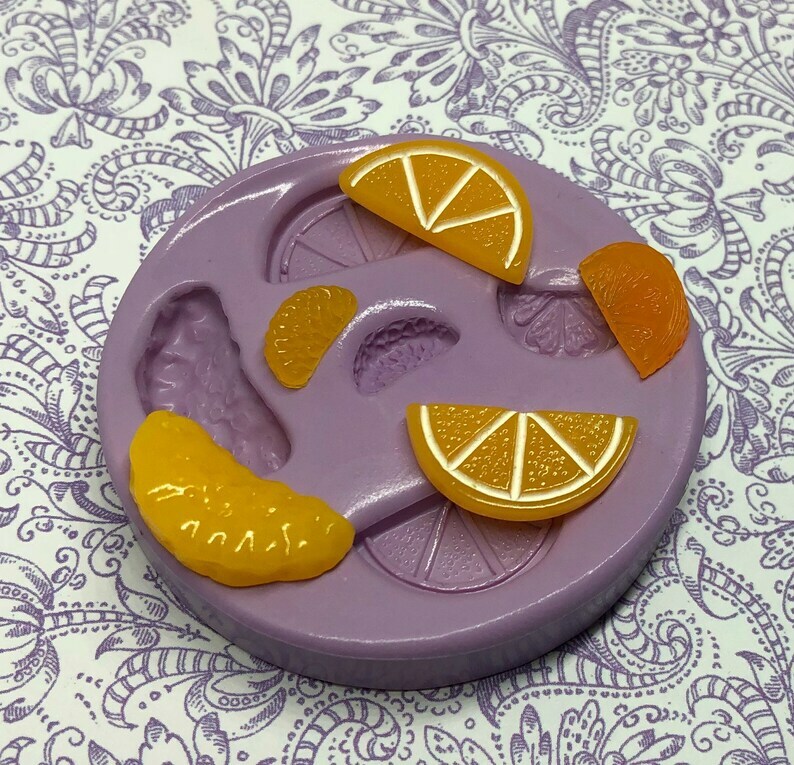 *You can make soap embeds for larger bars of soap to embed or attach to the top! *Resin charms or pendants are another idea. I use Easy Cast Resin and colorants. *Polymer and Ceramic clays work well in the molds. Although molds cannot go in the kiln, they may be used in the oven according to your polymer clay package instructions. *Utee and hot glue work in the molds, however, bubbles do occur and are unavoidable in the finished piece. Keep molds away from children. Not a toy. Please wash all new molds gently with warm, mild soapy water prior to first use. Keep all molds used with non food items separate from molds you use with food. i.e. don't use a mold with resin then use it with fondant later. Please Read the Safety and Data Sheets Prior to Use. Made my first hand soaps with these and they turned out great! Absolutely lovely and a perfect size for a large painting for a dollhouse. You know, one of those statement makers. Everything I buy from this shop is beautifully crafted and perfect over years of use- even by children. I accept PayPal, debit cards and credit cards. ~ Your happiness with our transaction is my goal. If your package is lost by the USPS please file a lost package report with them. With their new GPS location scanning/package tracking it's now easier to find MIA packages. Send me the case number so I can verify with the USPS that the report was filed. Once they finish their investigation if they determine your package lost I will send you a new package. If you ordered molds and they are not the size you wanted and you didn't check the size prior to purchase you may mail the Unused molds back to me and I will refund the cost of the molds only. Shipping will be your responsibility both ways since it was your error. If the issue is my error and the molds are defective, damaged or I sent the wrong molds please send me a picture of the problem mold. I will not require a return of the wrong/damaged mold and will send you a complete refund OR mail you a replacement package immediately after your picture of the issue is received by me. At this time I am not accepting custom orders. IMPORTANT NOTE FOR INTERNATIONAL CUSTOMERS: Contrary to what is currently noted in my listings, VAT, GST and/or other applicable country taxes are NOT included in my purchase prices, and additional taxes may be collected in your country of origin at time of delivery. Please take this into consideration before purchasing. Thank you. I cannot control the time it takes to get to you once it is mailed or the customs or duty taxes and fees your country may impose.